Trump voters really like renewable energy. Someone should tell Trump. Just last week Trump twice insulted wind power—the energy source that supplied more new power generation globally than any other technology last year—while also finding time to promote clean coal, a thing that doesn't exist. A new Pew Research Center analysis found that many Trump supporters align with his commitment to overlooking the harmful externalities of using fossil fuels (climate change, air pollution, environmental degradation), but it also shows a surprising level of support for renewable energy. This is surprising not only because of Trump's disdain for the wind power, but also because of the way most Trump supporters don't even believe in human-caused climate change, let alone care about trying to mitigate the impacts. According to another recent Pew survey, only 15% of Trump supporters care a great deal about climate change. About the same number believe that climate scientists understand very well whether or not climate change is occurring. While the new analysis determined that most Trump supporters “favor increased production from coal mining, fracking or offshore oil and gas drilling,” it also found that 84% of them say they favor more solar farms and 77% support more wind farms. 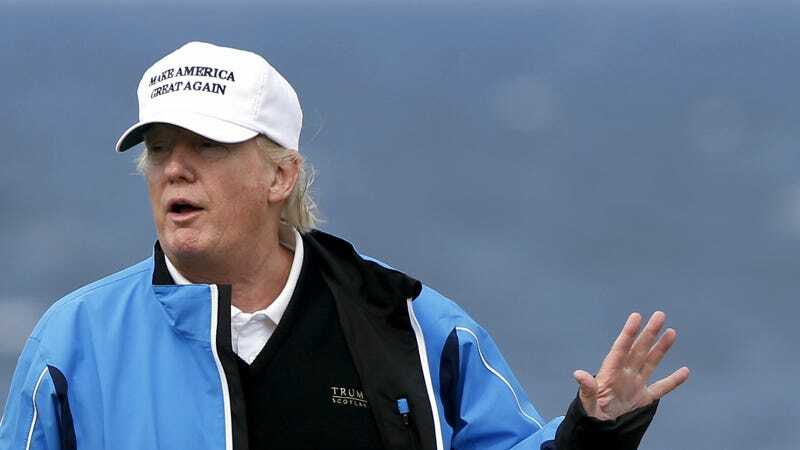 So when Trump insists on bashing wind power (which may have something to do with the way the turbines could obstruct his golf courses’ views) he is maybe not actually preaching to the choir, but turning supporters off. Alternatively, the report found that Hillary Clinton supporters oppose expanding the use of fossil fuel energy sources and are even more in favor of clean energy expansion. About 91% of Clinton supporters said they favor more solar farms, with almost as many, 88%, favoring more wind farms. While more clean energy is favorable across the political spectrum, the real divide in the survey manifested when respondents were asked about coal. The issue of coal mining has been a very contentious one this campaign season. Trump has tried hard to court disenfranchised voters in coal country with promises of making coal mining great again while Clinton has focused more on revitalizing their communities and moving them away from coal. According to the Pew analysis, which was based on 1,324 registered voters, nearly 70% of Trump supporters favor more coal mining while around three-quarters of Clinton supporters oppose more coal mining. Trump supporters are also far more likely than Clinton supporters to favor more offshore oil and gas drilling (66% vs. 28%) and hydraulic fracturing for oil and natural gas (58% vs. 28%). In an August speech in Abingdon, VA, Trump said Obama’s efforts to reduce domestic greenhouse gas emissions have been a “horror show” for miners, and that Clinton would be even worse than Obama if elected. “The mines will be gone if she gets elected,” he said.